With our activities being so exciting and stimulating, at this age, our Foxcubs children will always have fun and every day will always be a new adventure. Our little ones in Foxcubs fill their day with music, imagination, lot’s of outdoor play, (our forest school is a favourite), singing and stories, as well as being encouraged with social and self-help skills (such as potty training). Parents are welcome to contribute to the planning if they wish. The toddlers are introduced to circle time and your child will enjoy a variety of activities including, role-play, music and movement, sand and water, outdoor play and art & craft activities. 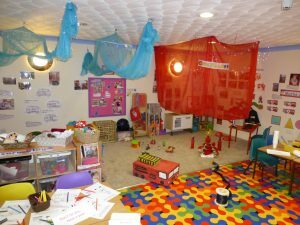 All of our toddler rooms have an area where children can get involved in messy play, painting etc. These areas are set daily for the children to explore. Foxcubs children will enter a wonderful world of imagination, having a fun filled day full of praise and encouragement. Our little Foxcubs are always on the go! They are given a wide range of activities to choose from and are always encouraged to try something new. They love to play in the garden, and climb to the top of the castle to watch the trains go by or stretch their imaginations to the fullest with the help of the enthusiastic staff. At this age as long as the activities are exciting and stimulating our Foxcubs will always have fun and every day will always be a new adventure.